The staff at Hot Trends pose with their best friends. Clockwise from top left, Stephanie Richards with Lilly, owner Dawn Billion with Buster, Alexandra Georgeff with Snoopy, and Jamie Wardhaugh with Bandit. On October 23rd, from 11 am to 6 pm, Hot Trends Salon at 501 East Broadway in Fulton is hosting a cut-a-thon and adoption day to benefit the Oswego County Humane Society. The benefit will feature $5 cuts for men and children and $10 cuts for women 15 and older with all proceeds being donated to the Humane Society. Lunch will be served and there will be a raffle, and baked goods for sale. There will also be pets available for adoption from the Humane Society on display at the salon. People who are interested in adopting a new pet should bring a letter of reference from their veterinarian and, if they are renters, written consent from their landlords. 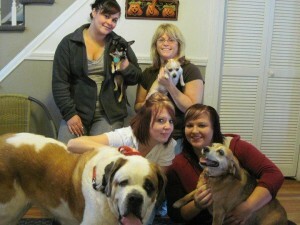 All animals rescued by the Humane Society are now living in private foster homes and are therefore well socialized. All are spayed or neutered or will be before their adoption is final and all are up to date with vaccinations. Foster families have the opportunity to report how well they get along with other cats, dogs and children. Pictures and more information can be located at the Humane Society’s web site at www.oswegohumane.org. For more information, call the Oswego County Humane Society at 315-207-1070.